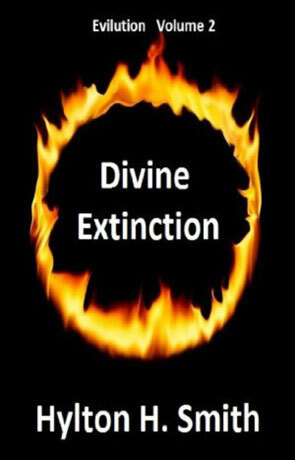 Divine Extinction is the second volume in the Evilution series, a near future series set in an alternative history, written by Hylton H Smith. Four years after the narrow escape from a cataclymic disaster humanity thought itself safe and sound, recovered and with a stronger, safer SACRED system. But the original founder of the system in not without power or influence, even behind bars. Where humanity may have learned from their mistakes, so have the terrorists and they haven't given up in their quest for power. Divine Extinction picks up the story four years after the events of The Sacred Protocol but where the previous novel was very much a scifi detective novel, this book has a very different feel, with a hard scifi edge and a straighter storyline. The main protagonist's of the previous novel do make an appearance although this is somewhat muted to begin with as we learn about the new threats to mankind. There is a much greater emphasis placed on the bad guys of the story (at least in the first part of the novel) which results in the antagonist's given a real sense of depth while much time is also given over to the mechanics of the story. Time is also spent exploring the ideas and technology behind the various discoveries and I loved the way the author managed to tie in real world events - such as the massively powerful explosion over the Russian area of Tunguska in 1908 (now known as Krasnoyarsk Krai). Featured in over 1,000 investigations, reports and scholarly publications, the Tunguska explosion is thought to be a meteor or comet fragment tens of meters across that caused a large air bust and impact crater, an explosion that would have been 1,000 times more powerful than the atomic bomb dropped on Hiroshima. The resulting shock wave would have registered 5 on the Richter scale and covered over 830 square miles flattening 80 million trees. The story itself is very intriguing, with enough twists and turns to keep the reader interested however there is a lack of a central protagonist for a large part of the story, with the focus instead being firmly rooted in the minutiae of the plot and the resulting investigations. This is more than made up for by the many ideas that are presented - there has clearly been a large amount of time and effort spent researching and considering many of these and it does result in some very convincing descriptions. I also liked the optimistic viewpoint in the face of possible adversity which goes along the lines that you have to assume the best otherwise humanity will crumble under it's own despair. There are some powerful messages within the book, religion and faith make appearances which include effects of cult worship alongside the faith of agnostics and atheists - many of whom share a common replacement faith in technology instead (you only have to look at the "Apple" effect to see this in action). Humanities aspects in the face of adversity are also explored to a lesser degree, as is the drive to alter our own destiny. The last few chapters manage to grip the reader and the book cumulates in a very powerful ending. Divine Extinction isn't as easy going as the Sacred Protocol, with it's harder scifi edge and investigation on past and possible future events but nonetheless it is a engaging story with some very well thought out ideas, recommended. Written on 15th June 2011 by Ant.